Information for potential and current students, regarding programmes and modules offered within the discipline. Also answers commonly asked questions about the discipline. Information for current students, regarding timetables, course material, practicals and tutorials for the offered modules. Our research activities in the form of staff expertise. A listing of our current staff members with hyperlinks to their homepages. A brief summary of the facilities within the discipline. Any application of mathematical techniques to solve a problem in the real world falls within the province of Applied Mathematics. Problems vary from very simple to extremely complex - from working out the petrol consumption rate of a car to calculating the flight path of a spaceship from the earth to the moon. 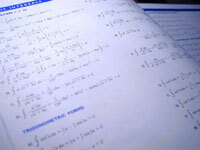 Traditionally, at University level, Applied Mathematics concentrated on problems in Physics and Engineering. However as the availability of computers became more widespread, Applied Mathematics became increasingly involved with problems in many other disciplines. For example, at the University of KwaZulu-Natal (Pietermaritzburg), Applied Mathematicians have worked on problems in ecology, agriculture, economics and sociology. There are three basic steps in applying Mathematics to the solution of problems. The first is the 'modelling' stage in which the problem is translated into precise mathematical equations The second is the identification and use of the relevant mathematical techniques to solve that mathematical problem and the third the interpretation of the mathematical results and their implications for the original problem. In the first stage the Applied Mathematician is faced with a problem expressed in broad terms. Two examples are (i) How many colours are needed to colour a map in which countries with a common border must be coloured differently? (ii) What policies should be adopted by the South African Meat Control Board to ensure the stability of prices and supply of meat? Presented with questions such as these, the Applied Mathematician must try to quantize the problem, that is, he must identify the important variables of the problem and write down the relationships among those variables in terms of mathematical equations. At the conclusion of this stage the original problem will be expressed entirely as a mathematical problem. Problems originating from different sources often take on a similar mathematical form. So, for example, the map-colouring problem and the problem of drawing up a lecture time-table that minimizes the number of classrooms needed have similarities that suggest their solution might be found using methods from the same branch of mathematics viz Combinatorics. Similarly, the Meat Board problem and the design of a stable steering mechanism in a car both involve the use of Control Theory for their solution. It is the task of the Applied Mathematician, in this second stage of problem solving to identify the branch of mathematics in which this problem falls and then to select and use the appropriate techniques from this branch for the solution of the mathematical problem. In the third stage the results from solving the mathematical problem must be interpreted in terms of the original real-world problem. Often the interpretation is unsatisfactory and it is necessary to reconsider the model. Eventually valid conclusions may be drawn regarding solutions of the original problem. Over the last 300 years, however, it has become clear that mathematics is an important subject in its own right, and not just a slave to other disciplines. Scientists have become aware that in order to develop powerful problem-solving tools, one needs quite abstract mathematics; a body of pure mathematics is required which can be studied independently of physics, biology and other user-disciplines. Pure and Applied Mathematics are therefore offered as different subjects, although there is much interdependence between them and each serves as an inspiration to the other. Our first year Mathematics modules (Math 110/120) attempt to bridge the gap between maths for use in other subjects and maths as a discipline in its own right. Applicable topics such as calculus, linear algebra and introductory combinatorics are taught, but as the course progresses, there is a gradual increase in the rigour with which these topics are treated, thereby ensuring that the students have exposure both to the activities of the pure mathematician and to the techniques required by the applied mathematician and other scientists. Thus at second year level, the student is in a reasonable position to select either pure or applied mathematical courses for specialization or as a background to other major subjects. A student who chooses to proceed to level 2 and/or level 3 Mathematics modules will study such topics as advanced calculus, linear algebra, abstract algebra mathematical analysis and topology.